The Future's Rosie: A World Without Down's Syndrome? A World Without Down's Syndrome? Some of you may have noticed (many of you won't care!) but it's almost a year since I posted on here. Not something I'm proud of nor ashamed of but it has made it harder each time I approach the keyboard to know where to start with all of Rosie's achievements (and mischiefs) in the past 12 months. "Driven by the experience of raising her son Olly, who has Down's syndrome, Sally explores some of the ethical implications of our national screening policy." This could be an important documentary for something that is so so important to me when new parents are faced with a pre-natal diagnosis of Down’s syndrome. That something is, ‘choice’ and not just choice but INFORMED choice. This was one of the primary reason’s I started The Future’s Rosie and it continues to be the driving force behind why I (albeit sporadically now) blog and share personal moments of Rosie’s life on social media. This in itself isn’t easy as I question myself daily about whether it’s the right thing to do – do people really see why I do this or do they carry the opinion I’m exposing what would otherwise be personal family moments as a selfish need for attention? I can answer those that think the latter by saying in all honesty life would be much simpler and less hassle for me if I didn’t do it at all, I’d much rather live in a world where Rosie’s condition wasn’t something I felt I needed to share to show ‘it’s okay’. Too many people are afraid of the ‘unknown’ with Down’s syndrome – yes I was that person too once which is why I know it’s a very real problem. I’m not and never intend to be a part of any ‘PC brigade’ most DS advocates don’t either. For me it’s always been about educating in a non-patronising way and if that means sharing my daughters life to help the cause, then for now at least I’m still positive it’s the right thing to do – even if it is a mere drop in the ocean of change. I, along with so many other parents am very grateful that Sally, who is already in the public eye for professional reasons has used her platform to reach people on a much grander scale than someone like myself could ever dream of. This isn't a small gesture either I would imagine it's taken an awful lot of hard work, careful contemplation and courage. Sally is now exposing herself to inevitable debate and criticism which can’t be easy – all for the greater good of educating society to the 'other' side of 'Down's syndrome, a side that many healthcare professionals would have you believe doesn't exist – and as you may or may not know I say that from first-hand experience. If you get the chance please do tune in to watch or set your record buttons! The more people that see this short film the better so please share and spread the word too! A world without Down's syndrome would be a world without my baby, my beautiful girl, 'Daddy's little Princess' and to that I say a resounding no thank you. Tom I am so pleased to see you write this important update on The Future's Rosie blog site. Sally Phillip's documentary has already got a lot of publicity and the programme will raise greater awareness of the issues surrounding screening. I have always supported the right of women to terminate a pregnancy should they decide to do so and my views on this have never changed. But I firmly believe all parents should make this decision having considered ALL of the facts. 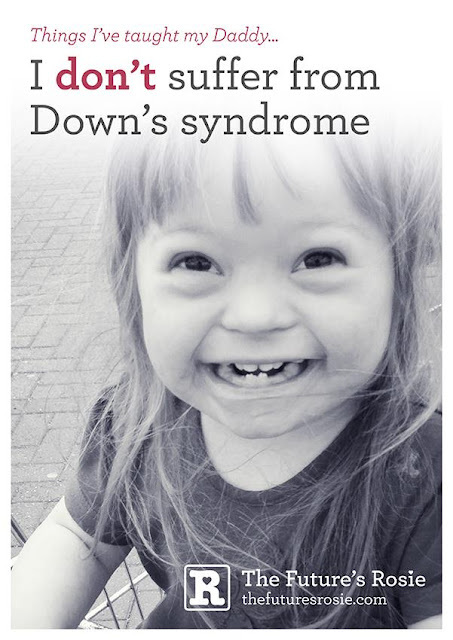 The problem at the moment, although blogs like this one are helping to change attitudes, is that there is still a lot of ignorance and fear surrounding Down's syndrome and as a consequence many people still believe it is the end of the world when they receive a positive diagnosis. As a parent who has a child with Down's syndrome I know this is not the case and it upsets me to think so many lives are lost because decisions are made in a state of blind panic and ignorance. The unborn child isn't given a chance to demonstrate the joy and happiness they would bring to these parents. The new test for Down's syndrome is going to make it easier for parents to get an accurate test and at the moment it's quite likely this will result in even more terminations. But if society is going to go down this route and people are going to be given the freedom to make this choice let's also make sure those counselling the parents provide them with ALL the facts. Which is why Sally Phillip's documentary is SO important and why this blog is as well. Parents with children who have Down's syndrome know for a fact the world would be a poorer place without them. And this isn't just a case of blind parental love overlooking the difficulties of having a child with a disability. God knows we are more aware than anyone of the challenges we face every day - most of them because of the battles we have to fight on our children’s behalf. And yet despite this I don't know of any parents who have a child with DS who wish they had never been born. So programmes like 'A World Without Down's Syndrome' aren't aimed at us. They are for the people who have no or little experience of Down's syndrome. They are for the prospective parents who have just received a diagnosis that the baby they are expecting might have Down's syndrome. They are aimed at the doctors and midwives who come into contact with pregnant women or women who have just given birth to a baby with Down's syndrome. Because only by challenging the fears and prejudice that still exists are we going to reach an even playing field where the degree of informed choice matches the precision of the antenatal testing. So thank you for blogging Tom, now and in the past, and thank you to all the people who help carry forward the debate. It can be exhausting at times trying to challenge others ignorance and there are occasions when you feel why should we have to go around justifying the right for our children to exist. We don't need to prove how much we love them or them us because it's evident in the joy in their smiles and the happiness they give and receive. But we don't do it for our own kids, we do it for all those children who have yet to come into the world who might otherwise never do so if we didn't challenge the ignorant stereotypes that still prevail. They don't have a voice. We have to speak on their behalf. Hi Laurence! Thanks so much for commenting and writing such a great piece. You really should start a blog of your own you have a great way of expressing important points without shying away from the realities too. Love to you all and look forward to catching up again soon. Thank you to everyone for your support.